From the will Common Cease & Desist like Kanye department... Thanks to Kunal Merchant for the heads up! 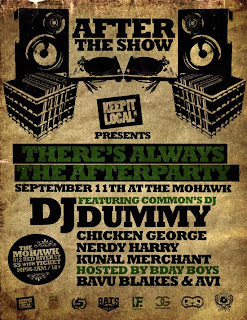 DJ Dummy, Common's DJ @ Mohawk on Sept 11th after the Common show! On top of all that, we've got an Austin powerhouse of Chicken George, Nerdy Harry, Kunal Merchant, Bavu Blakes and Avi!